The Rexel Whisper V35WS Cross-Cut Shredder is an ultra quiet personal shredder capable of shredding up to 6 sheets of 70gsm paper at a time. With a noise level of only 58dbA, this machine is designed to be up to 50% quieter than normal shredders, making it ideal for home or small office use. The shredder shreds an A4 sheet of paper into approximately 200 cross-cut pieces measuring 4x45mm, giving it a P-3 security rating. This makes it suitable for the shredding of confidential documents. As well as shredding paper, it will also get through staples and paperclips, saving you the time of having to remove these prior to shredding. 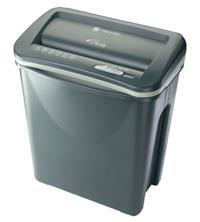 The waste bin capacity is a decent 18 litres, which will hold up to around 100 shredded sheets. To empty the bin, simply lift off the lid. Warranty period on the Rexel Whisper V35WS Cross-Cut Shredder is 2 years.